First Degree Fitness Evolution Indoor Fluid Rower - E520, the E520 Indoor Rower is FDF’s champion indoor water rower designed for the health club or commercial gym environment. The water rowing machine’s shorter length, higher seat and rugged performance ensure a robust performance, perfect for any fitness level. 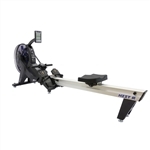 This E520 Indoor Rower offers unrivalled natural catch and resistance, featuring FDF’s patented Variable Fluid innovation for instant adjustable resistance at the turn of a lever. Our twin tank water resistance rowing system delivers a massive range of resistance to suit every rower, from de-conditioned seniors to professional athletes and personal training. Tank: 20 Level Patented Variable Fluid Resistance (VFR), to Suit ANY Fitness Level. Monitor: Interactive Performance Monitor (IPM) with USB Port: The IPM Displays: Time; Speed; Distance; Stroke Rate; Calories Per Hour; Watts; 16 Level Adjustment, Pacer. The IPM gives you quick start, manual programs, interval training, USB port allows Interactive Programming.” – Fitted with Heart Rate Receiver as Standard & Compatible with All Main HR Belts. Footboard: Height Adjustable Footplates with Advance Heel Cradle Footboard Design (Reg, Design) and Straps to Ensure Optimal Foot Placement and Comfortable Rowing Position. Frame: Rigid Frame Construction for Maximum Stability. Seat: Seat at “Office Chair” Height for Ease of Entry and Exit. Optional Back Support Handle: Deluxe Ergonomic Handle Allows Comfortable Grip and Minimised Strain on Forearms Wrists and Hands. Rail: Extended Transport Wheels for Ease of Movement. Tough Hardened Dual Anodised Aluminum Seat Rails.